Three years ago, Viktor Fasth was a 27-year-old goaltender working a day job as a high school teacher to supplement his income while playing for Vaxjo in Sweden's second-tier hockey league. Today, he is the NHL's hottest goalie and is moving his family into a new apartment in Southern California. He has earned that newfound security after signing a two-year contract extension with the Anaheim Ducks, who announced the deal Wednesday afternoon. Per club policy, financial terms of this extension were not divulged, but Eric Stephens of the Orange County Register reported it was for $5.8 million ($2.4 million next season and $3.4 million in 2014-15). It's a great moment for the 6-foot, 186-pound netminder who bounced around Sweden's lower hockey leagues before taking the NHL by storm as a 30-year-old. Fasth eventually earned his spot in the Swedish Elite League in 2010 with AIK, where he starred for two seasons. It was there NHL general managers started to take notice. "After my first year in the Swedish Elite League, there were teams starting to contact me. That's when I first thought it would be a possibility [to play in the NHL]," said Fasth, who recalled his days splitting time between hockey and teaching. "I had to do it to be able to play. There were some tough times, but I'm glad that I did that. It's pretty tough in the lower leagues there." Fasth signed a one-year contract with the Ducks in May to be Jonas Hiller's backup. But Fasth got off to a strong start and injuries to Hiller allowed Fasth to gain even more regular playing time. The team has barely looked back since. Along with his flawless 8-0-0 record, Fasth sports a 1.78 goals-against average and .933 save percentage. He was named the NHL's Second Star for last week, and with a victory in his next start he would tie Ray Emery's record of nine consecutive wins to start an NHL career (set with the Ottawa Senators). It's a remarkable turn of events for a goalie who wasn't on the NHL's scouting radar well into his 20s. His play with AIK earned him the Goldpucken (Golden Puck) award, handed out annually to the best hockey player in Sweden, as well as attention from NHL GMs. But it was his play at the 2011 World Championship in Slovakia that likely punched his ticket to the NHL. And in typical Fasth style, it was an unlikely performance. "I just try to work hard and I'll play when the coach tells me to play. That's how things work. You always try to do your best and help the team as much as you can. That's what I've been trying to focus on." Coming into the tournament, Fasth was not expected to be a part of the Swedish national team that had won bronze in each of the two previous tournaments. The team had already begun its training camp and exhibition season without him on its roster. But Stefan Liv turned down his invitation to the team, opening the door for Fasth. Fasth was expected to back up Erik Ersberg, but when Ersberg disappointed in a tournament-opening 5-4 shootout loss to underdog Norway, coach Par Marts named Fasth the starter. In seven games, Fasth registered a 1.71 GAA with three shutouts, leading Sweden to the gold-medal game and earning tournament MVP honors. "I just joined the national team before the World Championship. 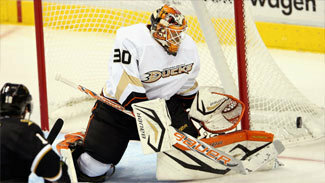 I guess I came in pretty late there," Fasth said. "It's a big window for every player, especially in Europe, to play on the national team. There are a lot of scouts there in the crowd. I think that's the best way to show the guys how you can play." Almost two years since that MVP performance, Fasth appears to have found himself a home in the NHL. But despite the contract extension and unblemished record to this point, he refused to name himself the Ducks' starting goaltender. "Jonas played against [the Columbus Blue Jackets] our last game here and played incredibly good. I just try to work hard and I'll play when the coach tells me to play. That's how things work," Fasth said. "You always try to do your best and help the team as much as you can. That's what I've been trying to focus on. That's what I have to keep doing."